Following advanced tooth loss, it’s important to begin the tooth replacement process immediately. When you’re missing numerous teeth, your whole body health is at risk. The simplest daily task like eating meals or smiling are suddenly difficult or impossible. 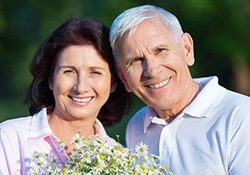 At Dentistry by Design, our dedicated dentists and dental team are here to help you with all of your restorative dentistry needs, including the creation and placement of partial or full dentures. If you’ve lost several missing teeth or a full row of missing teeth, please call to schedule a consultation visit with us in our Bartlesville dental office right away. We look forward to helping you put the smile back on your face. Following extensive tooth loss, you should begin the tooth replacement process immediately. The longer you go without replacing teeth, your oral health becomes further diminished. You may experience the loss of gum tissue volume or jawbone density. Every lost tooth impacts the rest of your smile, and if you haven’t already lost all of your teeth, not replacing missing teeth increases your risk for further tooth loss. Partial dentures, often referred to simply as partials, are used to fill in the gaps left by extensive tooth loss. A partial can be used to replace any number of consecutive and nonconsecutive missing teeth. A gum-colored base material is molded to fit snuggly between any remaining teeth. Then, replacement teeth are attached to the base. The entire partial is held in place by metal clasps attached to remaining teeth. Full dentures are crafted, like partials, using a gum-colored base material to support a full row of replacement teeth. Because there are no remaining teeth to support the denture, these prosthetics rely on natural suction between the gums and base material to hold them in place. When properly fitted, full dentures should remain firmly in place, but some patients find it reassuring to use a small amount of denture adhesive to improve the stability of their denture. For maximum security, you may want to consider a dental implant supported partial or full denture. These restorations look, feel, and function more like your healthy, natural smile, and can restore 70% or more natural chewing ability compared with just about 20% with traditional dentures. Your partial or full denture will need to be cared for properly to ensure you maintain the best fit and function as long as possible. You’ll need to remove your dentures to brush them before going to sleep. Then, store your partial or full denture in water or cleaning solution overnight. 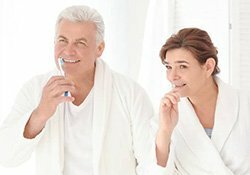 Before you replace your dentures in the morning, you’ll need to rinse off any cleaning solution. You should also brush and floss any remaining healthy teeth at least twice each day. If you are completely without teeth, you should clean off your soft tissue by brushing gently and/or use an antimicrobial mouth rinse to remove any plaque buildup or foreign debris on the soft tissue.